As early as February, SW-MOTECH presented its small, compact ION S tail bag. Now the accessory specialists from Rauschenberg have added two more and made the ION series complete with the ION M and the large ION L: each of these three bags fits more than 400 motorcycle models - so everyone can find the right bag for their bike! Just in time for the start of riding season, SW-MOTECH presents the new aerodynamic URBAN ABS top case. This sporty, lightweight, and robust top case is perfect for everyday and leisurely touring. With a volume of 16 to 29 liters, it offers enough space for luggage, and even a helmet if needed. 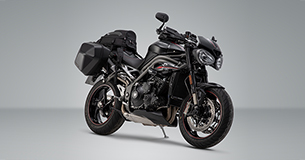 Visually, Triumph Speed Triple models have remained faithful, but their engine has undergone a radical transformation. If you also want to step on the gas when it comes to accessories, you'll find more than 160 parts in the luggage, safety, protection, ergonomics and navigation categories at SW-MOTECH. Ideal for small and sporty bikes: The volume of the ION S tail bag can be expanded via zipper from 7 to 15 l and therefore offers enough storage for drinks, a change of clothes, safety vest and other little things that you need on a daytrip or short trip. The hyper-naked bike from Austria features a new design and with powerful 1301 cm³ V2. 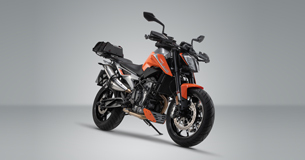 SW-MOTECH has more than 60 products in stock for the KTM 1290 Super Duke R.
The 2019 SW-MOTECH catalog will be released in mid-January – full of premium accessories for luggage, safety, protection, ergonomics and navigation. 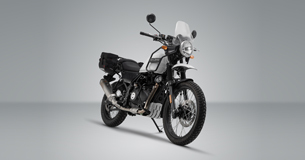 Amid the travel-enduro jungle, the Himalayan definitely stands out with its grounded, timeless and simple look. And SW-MOTECH has the right accessories for all kinds of tours. Not a whole lot has changed visually, but the BMW R 1250 GS convinces with its radically renewed engine. The variable valve control on the BMW ShiftCam provides superior power with plenty of power, despite lower consumption. Whether in the city, on country roads or offroad, the new BMW always pushes to the fore. 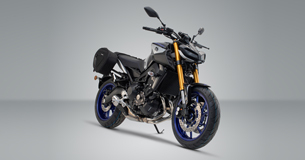 The Yamaha MT-09 hit like a bomb years ago, now the SP is impressing sporty drivers with Öhlins spring strut and a fully adjustable front fork. The exclusive color design of the Hyper Naked Bike is complemented by our black and gray EVO tank bags and BLAZE saddlebags by SW-MOTECH. For the season 2019 our colleagues in development and prototype construction really went to town. And when we have enthusiastic bikers working for us, it results in premium accessories that not only look good but also win people over in every day driving. Around 15,000 motor enthusiasts great and small came to Rauschenberg on June 16-17 to take part in SW-MOTECH's largest Open House ever. As always, the rule was "donation instead of admission free." This new naked bike is the first two-cylinder on the market from KTM. 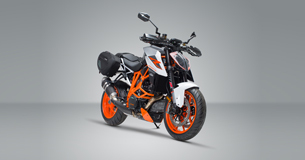 The 790 Duke with its high exhaust and rotated tank cap did not make it easy for accessories manufacturers. The F 800 GS got an addition to its family just in time for EICMA 2017. 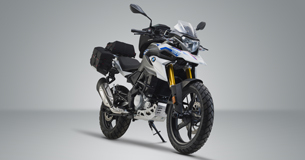 Besides power and height, BMW has made a few additional changes to the F 850 GS. 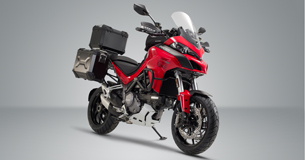 New motor, changes to swing arm and parts of the frame, re-worked electronics: Ducati has comprehensively evolved the Multistrada and promises even more driving comfort and better handling with the four versions of the Multistrada 1260. 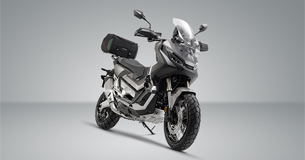 With the X-ADV, Honda has created something entirely new. The offspring of an adventure bike father and scooter mother? The X-ADV feels at home in many settings - whether on the road or in the field. Weekend, sunshine, motorcycles: On June 16 and 17, the motorcycle community came together for the 9th Open House in tranquil Rauschenberg. This year for the first time, the event lasted two days, and was attended by 15,000 people, three times more than last year's record-setting turnout. The retro trend continues. 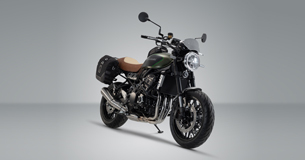 Kawasaki has resurrected the legend of the 70s, the Z1, and with the Z900RS have brought a really successful modern classic bike to the market. Thanks to its look, this Z900 is fun while stationary and all the more on the street. 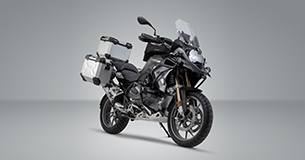 Even more robust, more ready for adventure - but still removable: With the introduction of the first removable carrier for motorcycle cases, we've made our mark on the accessories market, the PRO side carrier is the new generation. Offroad fans will be impressed. The bike-specific PRO side carrier, made from 2.5 mm thick steel, is extremely durable. Most popular enduro of 2018? 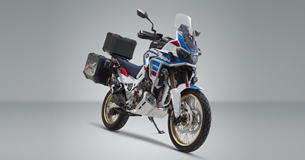 This year a head-to-head race between the CRF1000L Africa Twin Adventure Sports and the BMW R 1200 GS is expected. SW-MOTECH has well thought-out accessories for both. 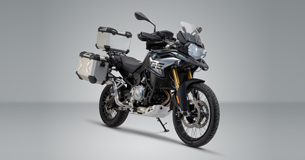 The handy BMW G 310 GS embodies the typical GS feeling and guarantees you driving pleasure in the urban jungle as well as off road. SW-MOTECH has suitable accessories for tours of all kinds on offer.